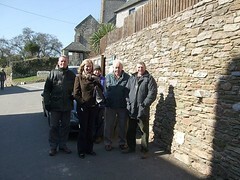 A full day out campaigning in Blatchcombe to listen to local and national concerns. Many residents spoke in detail about the difficulties they face now that they are retired and living on a fixed income. Time and again I hear peoples frustrations at having worked and saved all their lives only to find themselves ineligible for pensions credits and the value of their private pensions eroded by Labour's pensions raid. They are deeply resentful that the message of the last decade has been ‘don't save', most feel that they would have been better off spending all their savings and claiming benefits. We must restore faith in the pensions system and make saving worthwhile. A long distance driver expressed his disbelief that whilst he has to pay high motorway tolls abroad and high road tax and petrol prices at home he finds it difficult to compete with EU drivers when they are able to come to the UK and not have to contribute to road tax. ‘The Country should be run like a well run business', he commented. I agree, and really do feel that that is at the heart of Conservative philosophy. We cannot carry on spending more than we earn, somewhere, someone has to foot the bill. That can either be through higher taxes under Labour or by having a smaller State and more encouragement for businesses to thrive and provide jobs with the Conservatives. I want to see a smaller State and a bigger Society with people encouraged to get involved in their communities and take responsibility for their own actions. 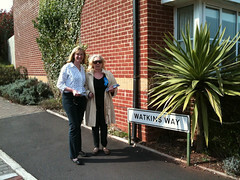 This was a full day's campaigning in Marldon, canvassing local opinions and enjoying the sunshine and a friendly welcome. Two families raised concerns about special needs education and the years of difficulties they had faced trying to negotiate their way through the assessment system. I have been very aware from my own professional experience that the process seems highly bureaucratic and cumbersome. It is hard enough to cope with the pressures of being a carer without having to cope with the paperwork and a system that feels designed to eliminate those parents who cannot shout the loudest. putting more power and control into the hands of parents and young disabled people themselves, so that they can ensure that they receive the right care and support to best suit their needs. Farm shops do so much to promote local markets for local produce. I enjoyed meeting Stepano Moranzoni at Dean Court Farm Shop to hear how he sources all his beef, pork, lamb and chicken from local producers as well as opening new markets. From Tony Coaker, I learnt how volunteering has helped with the rebuild of Rattery Village Hall and how they were at the leading edge in obtaining grants as a low carbon building to enable PV solar panels to be installed on the roof. They are now devastated to find that they will be penalised for commissioning just after the 15th July 09 deadline and will get nothing in return for the power that they feed into the national grid. It cannot be fair to give reduced or no reward to those who were the first to install these systems. For me one of the most memorable conversations of the day was with Ray Hardy, publican at the Church House Inn, Rattery. ‘I don't have the words to express the state we are in'. Pubs are under siege and we risk losing this part of our heritage. Binge drinking is not the fault of pubs but of ultra cheap alcohol from supermarkets. I would like to see us stand up for our rural pubs and save them from extinction. 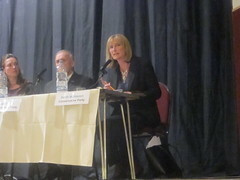 This was an opportunity to debate environmental and other issues, organised by Transition Town Totnes. The town has a national and international reputation for environmental activism; I would be proud to offer my support if elected as MP. I was asked by one participant, what MPs could do to help the environment. In my view, we can achieve most by making it as easy as possible for people to reduce their carbon footprint. If 90% of people can put in place an energy descent plan of 10%, that will achieve more than the other way around. Conservatives will introduce a green deal with the right to home energy efficiency improvements of up to £6,500. There would be no up front costs to the customer but it would be paid for over 25 years from savings on energy bills. I see the implementation of a smart grid and smart metering as the way forward to encourage individuals and businesses to take up micro-generation through a variety of means. Feed in tariffs should not discriminate against those who have already invested in technology such as wind and PV solar panels. We need to promote more investment in renewables so that we are not left behind, and the Conservatives propose a green investment bank to provide capital and green ISAs. No government should put their head in the sand in the manner that we have seen in the past decade. With the advent of peak oil, we must face up to a future with ever increasing energy costs and reduce demand. We cannot afford to delay building the infrastructure that is needed to replace the coal and nuclear power that are reaching the end of viability. These must not be replaced with polluting traditional coal fired stations which is why the conservatives will push forward with at least 4 sites for the development of carbon capture and storage. 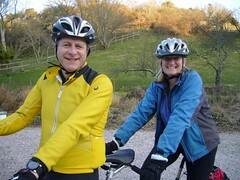 I have a particular interest in promoting safer cycling and have already been active, at the request of the cycling group, in promoting the Littlehempston to Totnes route, which could then become a vital link in NCN2. In countries where cycling is safe and there is secure bike parking, many more people chose to leave their cars behind. On this day David Cameron paid a flying visit to the West Country, where he spoke in Torbay about his plans to clean up British Politics and to restore faith in our democracy. Editor's notes. On item (1) above David again congratulated Sarah on her success in the first ever UK open primary as an example of how candidates should be selected in the future. 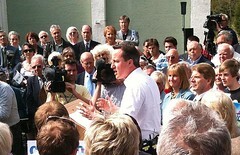 In the photo above, Sarah stands with Marcus Wood immediately behind David Cameron. Canvassing in Harberton today, I was shown an example of how empty properties could be used to help with the affordable housing crisis; one property has been abandoned for decades. Affordable housing is essential to the area but it should not mean that we build over prime agricultural land except in exceptional circumstances. We should also ensure that properties go firstly to local people who are committed to the area. Time and again, communities find that if people are allocated housing in rural areas without having transport or family links, they are isolated and unable to find work. It was also good to talk to Jennifer Wright, publican from the Church House Inn to hear how cheap alcohol in supermarkets severely affects rural pubs. It is hard to imagine villages like Harberton without their local pub; they need to be able to compete if they are to survive. Congratulations to the Brixham Community Partnership, which does so much to support volunteering in the town. At this evening's meeting there were presentations from 13 of the voluntary groups which operate in Brixham as well as in depth discussions on issues ranging from the hospital to the future of Brixham Regatta, now about to celebrate its 200th anniversary. The Police gave a presentation on the priorities that had been identified by residents, the most pressing of which was felt to be antisocial behaviour. Identifying hotspots and a system of escalating interaction with those responsible was felt to be the best way forward. This has been a day visiting businesses in Hannaford's Landing, Island Square and Fore Street. Hearing about the problems with the NHS dentistry contract and in particular the incentivisation of poor practice under the current payment system. 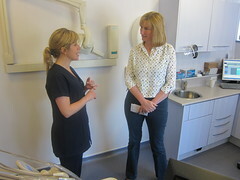 Dr Kathryn Dunning, dental surgeon, explained that she has capacity to take on more patients but is not funded to do so, even though many local patients are currently having to travel to Kingsbridge for NHS treatment. For the team at Pebbles of Salcombe, the number one priority is affordable housing, with the level of rents and housing costs making it impossible to live in Salcombe. They then suffer the further disadvantage of rocketing fuel costs and infrequent or slow public transport. Not feeling listened to was the main reason cited for not registering to vote. At an open meeting at Holy Trinity Church, the main issue was the NHS and in particular concerns about GP out of hours services. The current system was felt to be unresponsive, with two of those present reporting that they had had to call an ambulance as the current GP out of hours service was overstretched. 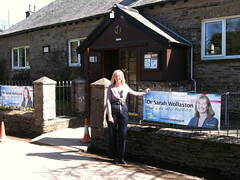 People at the meeting wanted to be able to see an out of hours GP more locally. 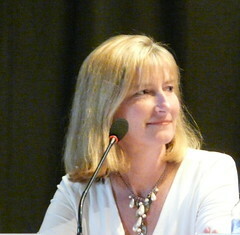 Targets and admission to inappropriate wards, together with examples of poor continuity of care were all issues raised about Derriford Hospital. Whilst the NHS is held in great affection there was a sense of unease that standards of care are slipping. After a fascinating trip to the the tourist information centre and the wonderful Maritime Museum and a stop for the outstanding crab soup at the Victoria Inn, it was time for more canvassing. Particular thanks to Emma and Sarah for their first hand insights into the crisis of affordable housing shortages in Salcombe. 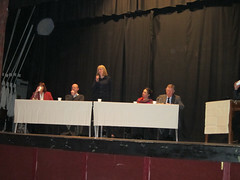 Congratulations to Brixham Community Partnership for organising an excellent final hustings of the campaign. Questions were raised about the Kingskerswell bypass, which is vital to Brixham's regeneration and the wider local economy. The Liberal Democrats will drastically cut road building, which will not be in the best interests of Torbay. Another important question was about what the panel would do to tackle the declining job market in Brixham, especially for school leavers and boys in particular? Nationally 1 in 5 young people cannot find a job, and this figure is even worse for young men in Brixham. In my view we need to look at reducing the barriers to taking on employees. Time and again, small business leaders tell me that they would like to take on more staff but cannot do so due to uncertainty about the future and the overwhelming burden of employment legislation, red tape, health and safety regulations and now the possibility of a rise in the employers contribution for NICs if Labour stays in government. Conservatives will stop Labour's jobs tax and fund 200,000 extra apprenticeships, 100,000 extra college places and 100,000 work pairings to help unemployed people to get work experience. Conservatives will give a £2000 bonus to encourage employers to take on apprentices. At a more local level, we need to encourage young people to become fishermen by supporting the fishing industry and allowing work experience in the industry to flourish. 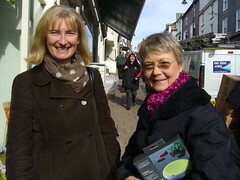 Kingsbridge Farmers' Market was a great way to sample local produce and enjoy meeting people along the way. We need to support farmers and encourage sustainability. One farmer today explained how farmers' markets help to level out the peaks and troughs for farmers. Lamb prices are currently at a high level, which means that lamb is selling well for export due to the exchange rate. However prices and foreign sales could fall at any time, so maintaining a local market is vital for farmers. If you have not visited the market, take a look on the first and third Saturday morning of the month and/or visit the Devon Farmers' Markets website. I also spoke to Sally Hurst, inspirational local businesswoman who set up The Old Bag Company from her kitchen five years ago. This thriving business now employs five people and sells in 400 outlets as well as exporting to Sweden, France, Austria, Belgium and Germany, all in the EU. I asked Sally whether she felt that withdrawal from the EU would help or hinder her business, and she felt that it would be harmful to exports. We must do everything possible to boost exports to help our economy and help companies like Sally's to thrive. Whilst Sarah was busy campaigning elsewhere in this extraordinarily diverse constituency, Rufus and Sandy left their patch in Kingsbridge for a full day on the trail in Blatchcombe. There really is no substitute for foot soldiers, and the whole campaign team are immensely grateful to them for their hard work. The photo on the left which they have uploaded is a rather unusual example of a front door bell which they came across. Donations for new shoe soles would be gratefully received. A gallery of downloadable photos taken is available here. This has been a full day's canvassing to cover both villages. Again I was hearing, at the top of the list, that people want to see a change in the way that politics operates in the UK. I did not hear anyone calling for proportional representation, but more a desire for politicians of all parties to work collaboratively. Naturally there is still anger about MPs expenses, with so many making the point that they would never expect to make such claims from their own jobs. I am not a professional politician and myself feel optimistic that, with so many new MPs in the next Parliament, that we have a real opportunity for change. People do want to see a new generation of politicians who have worked in the real world. It is clear that many families, and especially pensioners, are struggling financially on fixed incomes and need to be able to trust politicians to understand these pressures. 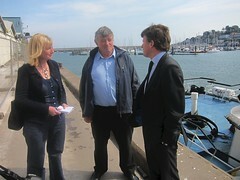 A great opportunity to meet with Richard Benyon and Brixham fishermen at the spectacular new fish market. Returning to meet Rick Smith of Brixham Trawler Agents, it is clear that the Brixham fishing industry is vital to the local economy but it faces an uncertain future. Rick explained the impact of volatile fish and fuel prices and the rafts of inspection and restrictions to which fishermen are subjected. Richard Benyon is committed to tough negotiation on behalf of the industry when the Common Fisheries Policy is renegotiated in 2012. We must see an end to the madness of fish discards and financial encouragement for projects like ‘minus 50%' whereby Brixham fishermen have altered their gear to drastically reduce the catch of unusable and undersize fish. Above all, fishermen need an increase in quotas and understanding at the highest level that, without fishing, the local economy would be in grave danger. Politicians need to see the industry first hand to understand how decisions in Europe affect real lives and communities. For every job at sea there are at least 5 or 6 on land and it is clear that the fishing port is one of the main draws for tourism. 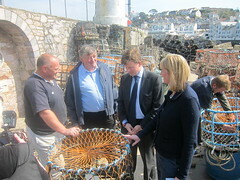 If elected, I will work with the fishing industry to keep Brixham high on the agenda at DEFRA. These were well attended public meetings with an opportunity to listen to local and national concerns and answer questions. I feel they are a more useful way to get to know candidates than hustings, especially when there are so many on the ballot paper. They are personal, relevant and interactive. An opportunity to hear about housing issues in Salcombe and the difficulties facing Town Councils. Salcombe is one of only 30 town councils to have been awarded Quality Status but has to manage within a budget of just £23,000 per annum. This is a difficult task given that the population of Salcombe explodes during the summer season but still has to manage with the same level of services as during the winter. We discussed the allocation of council tax funding and what could be achieved if more power and resources were devolved to local levels. We further discussed affordable housing and the need for communities like Salcombe to have greater control over allocation of affordable housing. The current restriction, of up to 15% of housing going to local people means that local families are forced to leave and leaves essential services like Salcombe Lifeboat at risk of being unable to find sufficient local volunteers. Key workers and volunteers should be prioritised for affordable housing to encourage community volunteering and maintain essential services. Salcombe has a reputation as a rich town, but the fact is that it suffers from low wages and exceptionally high house prices. Returning to Blatchcombe today, the issues raised were trust in politicians, the NHS and the constituency boundary between Torbay and Totnes. Half of the electorate within Totnes live in Brixham, Blatchcombe and Paignton and the constituency boundary is decided by the Boundary Commission rather than politicians to ensure that are all of approximately equal size. An anomaly of the system is that Conservatives have an inbuilt disadvantage and need a significant majority just to win an equal number of seats in Parliament. If you are not sure, just click on the map at the top of the diary map page and enlarge over your area to see on which side of the boundary you will be voting. Depressing as it is to have to sit next to the BNP for two hours, I accept their right to be there and continue to feel that our best answer is to soundly reject their racist policies through the ballot box. The BNP should lose their deposit in Totnes. On the issue of hunting with hounds, I have always said that I will use this as a way of trying to re-engage voters with open democracy if I am elected as an MP. People tell me that they want politicians who listen but I realise that they also want to know my personal view. I have avoided this until now for the single reason that I wanted to avoid accusations of bias in any result. The trouble is that this is misrepresented as fence sitting so, to clarify the situation, I do not hunt and would not wish to see a return to hunting with hounds. I would like to see our countryside traditions retained through trail hunting and know many people who now feel comfortable to follow a drag hunt who would not have felt able to support hunting live animals. I accept that this is an emotive issue and will still canvass opinion if elected and pledge to represent the majority view. For the record, when asked so far, the majority of people I have polled do not support a return to hunting with hounds. Please feel free to send me your views. T his was an opportunity to question Mark Francois about the many concerns that have been raised by voters in Brixham and the South Hams. Time and again the true cost of Europe is raised. UKIP widely quotes the figure of £120bn as the potential saving if Britain were to leave Europe and claims that no jobs would be lost. Both of these statements are untrue as they ignore the fact that the true net cost of Europe is between £4bn and £6.5bn as a result of the funds that flow back into our economy from the EU, and that many firms would not invest in the UK unless it were a springboard into Europe. I am sure that Britain needs to stay in Europe, but I wanted Mark to clarify exactly how we can reassure people who are rightly concerned that too many powers have been ceded to the EU without the consent of the British people. In summary, Conservatives will introduce a ‘Referendum lock' by amending the European Communities Act to ensure that no further powers can be ceded without a referendum. Unlike the LibDems, we will never give up the pound to join the Euro, and we will make it impossible for any future government to do so without a referendum. Conservatives will introduce a Sovereignty Bill and, through the manifesto, seek a mandate for this from the British people to establish that our Parliament has ultimate authority. It is in Britain's interests to remain in the EU, but to insist on a full opt out from the Charter of Fundamental Rights, not just the weak ‘clarification' accepted by Labour. We need to stop the European Courts of Justice interfering in our criminal justice system and repatriate powers over social and employment legislation such as the damaging European Working Time Directive. Fishing is at the heart of Brixham, and it has been badly let down by the Common Fisheries Policy. It is good news that the fisheries spokesman will be visiting Brixham and I look forward to hearing more detail of how the interests of Brixham, and other fishing ports along the South Hams Coastline, will be defended by the Conservative Party. Today I spent the morning canvassing opinion in Hillhead, to hear about how communities suffer when they lose vital amenities like local shops. Communities need meeting places like village halls, churches and pubs and, especially where bus services are limited, people can feel very isolated. Fortunately, there are very low rates of serious violence in this part of Devon, but even so, antisocial behaviour is a concern and people want to see this addressed by the local police. We also need to tackle some of the causes of problem behaviour, like binge drinking and taking a tougher line with offenders. Several people wanted to clarify policy on immigration, and there is a clear message about Conservative proposals if you follow this policy link. 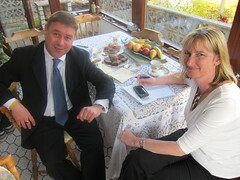 I later met up with Imke Henkel, London Correspondent for Focus magazine, one of Germany's leading weekly magazines. I attended an open meeting in Brixham's Conservative club, again to hear local views before again heading out to listen to people on the doorsteps. It was particularly interesting to hear how often Europe is raised as an issue and to also hear from Imke how Britain is regarded from the other side of the Channel. 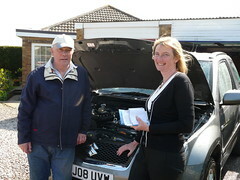 In the afternoon I visited Blatchcombe, where I was concerned to find two residents that had been told that the Conservatives would get rid of winter fuel payments. I was glad to be able to put the record straight: Conservatives will protect winter fuel payments and fully recognise just how important these payments are in saving lives during the winter. It is a national scandal that excess winter deaths amongst the elderly in Britain are so high, at around 20,000 per year. We know that in countries that are used to coping with cold winters that these excess deaths are far lower, so helping to insulate and warm homes during the cold months is essential if these unnecessary tragedies are to be avoided. 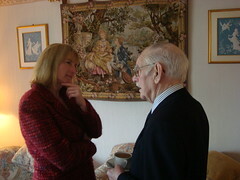 In the morning I visited Stoke Gabriel to listen to views about local and national issues. Many national companies have raised concerns about the effect of a rise in national insurance but it will also effect small businesses in Devon. Giles Shaw from Bay Tree Services explained how this would effect his bottom line and be yet another tax on local job creation. If elected, Conservatives will stop the NICs increase for everyone earning under £35,000 and make everyone earning under £45,400 better off. 7 out of 10 working people will be better off with the Conservatives than under Labour, and nobody will be worse off. I also visited the site of the proposed Rowes Farm development with Cllr Rosemary Rowe to see for myself just how inappropriate this site would be for 50 homes and the impact this would have on this small community. People resent large scale development imposed by regional spatial strategies. We will give genuine power to local communities to tackle the chronic shortage of affordable rural housing. We will allow villages and towns to create entirely new community-led bodies with planning powers to develop local homes for local people, provided there is strong community backing. Affordable homes built by local housing trusts will remain in local ownership in perpetuity, ensuring that future generations can benefit. Local housing trusts will be able to grant themselves planning permission, provided (i) they do not expand the community by more than ten per cent over any ten year period, and (ii) not more than 10 per cent of local residents object in a community referendum. Today I returned to canvass in Brixham, which is the largest centre of population in the Totnes constituency, and where I have spent a great deal of time in the last six months. On the doorsteps the key issues raised were the loss of trust in professional politicians, Europe and immigration. It was clear that most people are concerned about the slide towards a federal Europe that has occurred over the past thirteen years. The clear majority would like to return to a relationship with Europe based on key areas of economic cooperation. I believe that we should stay in Europe but seek at every opportunity to roll back European interference in our laws. I will support Conservative plans for a British Sovereignty Bill to make it clear that ultimate authority stays with the British people and not with the EU. Conservatives will keep the pound and never take the UK into the Euro, and they will guarantee in law that no further powers can be ceded to Europe without a referendum. I believe that social and employment powers must be repatriated to the UK. I also believe that the working time directive has been especially damaging to the NHS. On the second day of my campaign, I went to public meetings in South Milton and Thurlestone to listen to people's views on Europe and immigration. The importance of British sovereignty and resisting European interference were raised time and again. 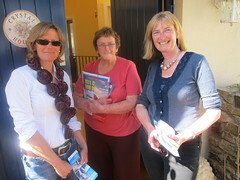 At Thurlestone the main issue addressed was waste in the NHS and the burden of bureaucracy. 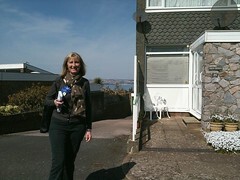 I then went canvassing in Hope Cove and Galmpton. In the evening I attended a meeting at the Flavel Arts Centre in Dartmouth to support a talk in aid of the Citizens Advice Bureau, given by Lord Boyce, the former Chief of Defence Staff. 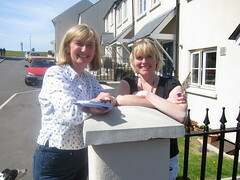 I launched my election campaign on this day in Kingsbridge, canvassing in three areas of town around The Warrens, Becketts Road and Trevanna Road. Uppermost in people's minds was the issue of trust in politicians. Pensions, the NHS and particularly provision for mental health services were all important. The safety of our troops and the future of our involvement in Afghanistan were also raised by several people. 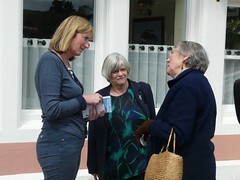 I dropped in to afternoon tea in aid of Saltstone Caring to meet Elizabeth Bewley-Jones and Lisa Butcher. 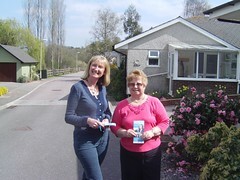 Saltstone Caring are an essential local link in Kingsbridge, and they welcome volunteers. In the afternoon I visited Belle Cross Farm to meet Doug and Jill Horton. A fortnight ago they received the devastating news that three of their herd had tested positive for TB, bringing back memories of losing 86 of their herd between 2006 and 2008. They now face a 60 day testing regime and months, if not years of uncertainty. The repeated loss of their cattle, low milk prices, and underfunding of compensation have taken a heavy toll on the dairy industry. We are becoming increasingly reliant on foreign milk imports and we are losing our sustainability. If elected, I am firmly committed to tackling the problem of bovine TB, and having met yesterday with the Shadow Secretary of State for Agriculture, Nick Herbert, I am happy to confirm that this is also Conservative Party policy. I then went on to meet Harry and Jill Kerswell at Bearscombe Farm, who have been farming at Kingsbridge since 1916. On the tour of the farm, I discussed the importance of entry level and higher level stewardship schemes and the geographically challenging nature of farming in the South Hams. Looking across some of the finest countryside in the southwest, it is clear that we all benefit from the care of British farming. Today I met with Hal Gillmore and John Crisp of Transition Town Totnes to discuss the Energy Descent Action Plan (EDAP), Catalyst Projects. In particular we looked at plans for a food hub and food linking project and the Transition Farms Initiative. If elected, I am keen to work closely with Transition Town Totnes (TTT), which has done so much to provide a platform for innovative ideas, projects and businesses to Totnes. To find out more about TTT look please visit their website. I look forward to being included in the Transition Town Totnes election debate on Wednesday 21st April. This was a wonderful opportunity to enjoy the annual Easter Saturday walk above the estuary from South Pool, now in its tenth year. The route is opened by local farmers in aid of St Nicholas and St Cyriac Parish Church and followed by a barbeque, duck racing and entertainment from the Millbrook Pub. Not to be missed. This was another opportunity to hear about the issues facing hill farmers and the difficulties of maintaining this fragile environment with falling incomes from the single farm payment system. Dartmoor is essential as a resource for clean water and South West Water is now implementing a system of blocking water courses to increase the amount of peat for water storage on the high moor. This will impact on the grazing available to hill farmers in the future. We must see that they are fairly rewarded for their efforts in order to maintain stock levels, so essential to maintain the quality of moorland vegetation and natural habitats. Environmental stewardship payments should be priced to fully reward upland farmers and attract young farmers onto Dartmoor. We also need fair labeling of food so that naturally produced meat from Dartmoor can attract the premium it deserves. 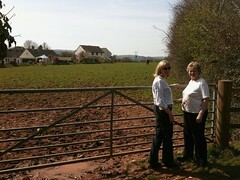 Visiting Stoke Gabriel, it is easy to see why there is overwhelming opposition to the proposed Rowes Farm Development. Single track access through high Devon hedgerows is part of the charm of Stoke Gabriel, but becomes a nightmare when inappropriate development is forced on a small community. Everywhere I went, residents were keen to express their dismay at the proposals and the dangers of becoming swallowed up by developments encroaching from Torbay, eroding the green belt and prime agricultural land. Conservatives have an alternative which would give power back to local communities. Affordable housing built by local housing trusts. These developments would remain in local ownership in perpetuity and provide affordable housing for local people. Housing Trusts would not be able to expand a village or Town by more than 10% over a ten year period and would not proceed if more than 10% objected in a community referendum. Conservatives would abolish regional spatial strategies and return genuine power to communities like Stoke Gabriel. 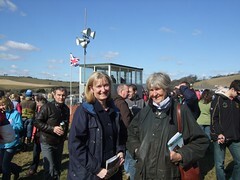 Meeting Anne and Gordon Tulley at East Farm today, the strength of feeling about bovine TB is clear. Their beautiful herd of Red Ruby Devons has a bloodline that can be traced back to the 1800s. This extraordinary breed will be at risk without action to protect cattle from the remorseless spread of TB. Spending time with the Tulleys, there can be no doubt about the impact of repeated positive tests and the premature slaughter of their cattle. We need action rather than the deceitful mantra that we should await vaccination trials. No vaccine will ever treat an infected badger and, if we leave it much longer, how many uninfected badgers will be left to vaccinate? A gentle 12.5 mile circuit, almost all along safe cycle paths or quiet lanes, through some of Devon's most beautiful countryside. Start at Steamer Quay in Totnes map OL 20 SX 808602 and turn left out of the car park then left again across the bridge. At the roundabout turn right and look out for the cycle path on your right, which takes you through the industrial estate, past the health centre and playing fields and then left signposted to Dartington. The path then joins the Cider Press centre, at which point follow the cycle way signs to Huxham's Cross. This path crosses the A384 but then follows a newly constructed path through fields to Huxham's Cross. At this point cross back over the A384 and take the quiet lane opposite to Staverton Bridge. Cross the railway line and head towards Staverton then keep right at Copper Tree Cross, following the signs to Littlehempston. This circuit is particularly good for pubs; one in every village but on this occasion we were keen to look at the proposed route for a cycle path from Littlehempston to Totnes, so we headed down towards the start of the route at the South West Water Treatment Works. This path would be so much safer than the route we were eventually forced to take, along the busy A381. I am always surprised at the way cycle routes are obstructed by a vocal minority who claim that they will lead to increasing vandalism or the threat of invasion by the lycra masses. In reality they provide a boost to the local economy with Green Tourism and improve the health and happiness of all who use them. I hope South West Water will allow a survey of their land to at least look at the feasibility of this route, without which this circuit from Totnes will never be safe enough for children. Back in Totnes, where better on a lovely spring day, than the Waterside Bistro to have lunch and read the papers beside the river Dart? I toured Kings Ash Primary School with Cllrs John Thomas and Jeanette Richards as well as Governors Wendy Burridge and George Thomson. Kings Ash opened in June 2009 in an astonishing new building and it now has 415 pupils taken from the merged Foxhole Junior and Foxhole Infants and Nursery. I also visited the Community Centre, currently nearing completion, that will then form the final part of the Kings Ash Community. This project is a tribute to the vision of Wendy, George and Stephen Foy, who together with strong support from local councillors and parents helped to push through an inspirational project with a remarkable design. The atmosphere in the school and the surroundings for the children are outstanding, especially the artwork, ‘Yellow Submarine' and dedicated IT areas. They have just been inspected by Ofsted and are awaiting their results. Strong communities matter so much, and projects such as this bring so many together. Already there is a long list of community groups booked to use the Centre, which aims to be open from 9am to 10.30pm and even earlier for the school's use. I may have to check in for the intriguing ‘Gossip and Scrabble' group or check my embarrassing dog Penny in for much needed dog obedience classes. It was good to meet with representatives of Beechdown Park, Hillside Park, Hatchmore Park and Falcon Park at the Blagdon Inn. They raised many concerns about their contracts and conditions and the need for Councils to enforce model contracts. It seems to me that Park Home Residents nationally should have the same rights as other leaseholders and I hope to be able to raise their concerns with utility companies. Point to Point Races are always a great day out. This was another opportunity to meet farmers and hear about the problems of bovine TB and the loss of dairy herds from the South Hams. We also discussed my position on hunting with hounds, which is that I will stay strictly impartial and conduct a poll of views across the constituency if elected. Clearly both sides of the debate will need to have a fair opportunity to put their side of the argument and it will be an opportunity for open democracy and debate. Canvassing views around Kingsbridge is a great way of meeting people who would not want to attend hustings or open meetings. 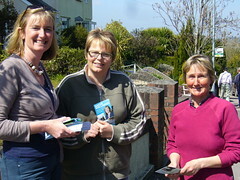 Despite the rugby most people were more than happy to share their views on local and national issues. You will need a map, I suggest OL 20 Ordnance Survey and I would recommend starting at Kingsbridge where there is ample parking at grid ref 735439 and an excellent opportunity for a stopover at the excellent Creek's End at the beginning or end of the ride. A Google Earth view opens in a separate window. Head off along the A379 following the signs to Dartmouth. The views across the estuary are staggeringly beautiful. Pass through the lovely villages of West Charlton, East Charlton, Frogmore, Chillington and Stokenham. 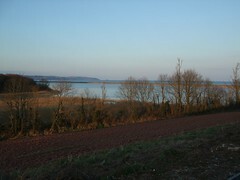 You will then have wonderful views over Slapton Ley and the sea. Carry on through Torcross and continue along the Slapton Line until the Higher Ley. The pain begins, prepare for a long slog uphill to Strete and turn left in the village centre. Continue uphill into lovely countryside as far as Cornish Wood and Stancombe Wood. At this point it is best not to have a snapped gear cable; the rest of our ride would have been a lot less painful. The views over the South Hams at dusk are unforgettable. Continue past Forder to Newton Cross where you will be joining the NCN2 for a short distance through Wallaton Cross as far as Cole's Cross. 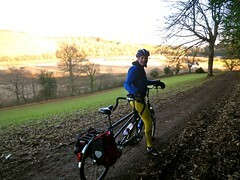 Fork right at Kingsbridgefork Cross and straight on at Selcombe Cross before heading right towards Bearscombe. Prepare for more pain uphill to Westerlands and then you will have earned the fabulous long drop through Kingsbridge back to The Creek's End. The public meeting at West Charleton was smaller and ran as a discussion forum. This is my favourite way to debate important political issues and I am fascinated at the way two meetings, even a short distance apart, will raise such different issues of concern. Some of course are the same, Europe always a hot topic in the South Hams. But in West Charleton, Afghanistan and immigration policy were raised as well as housing and the NHS. If you would like to host a house meeting or find out about other public events please get in touch. In the run up to the election, I will try to meet as many people as possible through a combination of public meetings, house meetings, hustings debates with the other candidates and door to door canvassing. This public meeting was a lively and well attended event with a question and answer format and plenty of audience participation from a wide spectrum of political viewpoints. The main focus was education policy and Europe but also covered issues such as binge drinking, policing, care provision for the elderly and pensions. We debated defence issues, human rights legislation, small businesses and the Abortion Act as well as inheritance tax and hospital parking. Who says politics makes no difference? All of these issues are political and never dull. If elected as your MP, I will always enjoy the opportunity to hear and take your views into account as I am determined to act as an independent minded advocate for the South Hams and Brixham. This was a fascinating day with a briefings housing issues and opportunities to visit small, medium and hi-tech businesses in Totnes. Tor Homes operates the largest housing association in the South Hams, having taken over the entire stock of council housing from SHDC in 1999. It is a registered charity and functions as a social enterprise. It employs 160 staff, half of them in direct maintenance including 2 apprentices. This was a meeting to discuss with Howard Topliss, CEO, the challenge to increase the level of affordable housing available to local people. A mixture of rented and shared ownership is required with a house building programme that is supported by local people. Conservatives will ensure that the benefits of development will remain within the community in perpetuity. We will encourage the creation of new bodies - Local Housing Trusts - for those villages that wish to develop new housing to benefit their community. These bodies will have power to develop new homes and other space for community use, provided there is strong local support. Later I visited a DT media, a high-tech business operating from Totnes and employing 17 staff. CEO, Tim Dewing, shared his views on how Government can help to support growing businesses. Totnes is also home to Devon Life and its partner magazines including Cornwall Life, Somerset Life and Wiltshire Life. This is a major local employer as well as providing opportunities for hundreds of freelance contributors. It was also good to catch up with Tony Osborne of Windeatts Solicitors, another important local employer and meet the Totnes Town Clerk, David Evans for a discussion about Local Government. It was good to meet with Chris Long, the head of Dartmouth Community College and take a tour of the school. The current low funding for Devon pupils disproportionately affects Dartmouth as it is the smallest secondary school in the county. Please check out the Fairer Funding website to join the campaign to redress the imbalance. It was also a chance to catch up on Dartmouth's plans make further ground breaking changes. Having already been the first secondary to become federated with their neighbouring primary school, sharing the expertise of governors, it will now press for Academy Status. I fully support this move and hope that it will bring much needed investment in the schools infrastructure as well as building on the head and governors' vision for improving overall results at the College. I am grateful to Cllrs Stanley Wreyford, Chris Wills and Alan Mallyon as well as Parish Clerk Steve Gale, for taking me on a tour of Blackawton to discuss important local issues like affordable housing and local democracy. It is important that Government understands the anger felt by small rural communities when threatened by the prospect of large developments. Few object to small scale development but a proposal to build up to 50 new homes is widely felt to pose a risk to a small village with very poor transport links. Parish Councils need to be supported and participation is bound to be encouraged if councillors have more influence over issues important to local people. They need a greater say in traffic management and more influence in planning decisions. At present they shoulder a great deal of responsibility without the benefit of real influence, the church wall being a case in point. Personally, I would like to see a greater charge for those who use retrospective planning as this often seems to result in buildings or structures opposed by local people. We need to encourage use of the system that allows residents to raise objections before and not after they are forced to live with the consequences. In Dittisham, I met with Cllr Stella Stottart, Mr John Stottart and Cllr John Tucker, to discuss issues like the level of second home ownership and again the issue of Parish Councils' influence over planning issues. Retrospective planning is also a problem for Dittisham as well as the difficulty of maintaining a sense of community when so many properties lie vacant for much of the year. Despite this difficulty, it is impressive that Dittisham manages to put on a pantomime as well as maintain a wonderful village hall and two pubs; a tribute to the determination of those who contribute year round to their community. 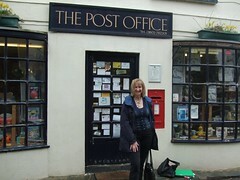 For both villages, the loss of much loved post offices last year has been a great blow. When will big Government start listening to rural communities? To see our plans, here is a link to the Conservative Rural Action website. North Sands to Bolt Head. OS Map OL20. A Google Earth view opens in a separate window. This has to be one of the most beautiful five and a half miles in the South Hams. I would recommend starting at the Pay and Display Car Park at North Sands, Ref 731383. Take the steep road towards South Sands and keep following the signs to Overbecks, passing the the National trust kiosk on your right. Carry on down the lane and keep left at the footpath to Starehole Bay and Bolt Head. The views at Sharp Tor are breathtaking. Carry on around the cliff path to Bolt Head and continue as far as GR 717367. At this point keep right and head through middle Soar and then keep straight on, passing the car park and continuing on a small country lane. At the junction take the footpath straight on to Rew and turn right past the campsite towards the beautiful hamlet of Combe. Keep right here and, at the start of the woodland, look out for a small path into the woods on your left. This will take you uphill again before dropping down onto a small lane. Keep straight on until you hit the road between North and South Sands. At this point, keep left back to North Sands. I would recommend lunch or a fantastic cream tea (with proper strawberry jam) at the Winking Prawn. This is the only restaurant I have ever visited with its own dressing up box; unmissable. 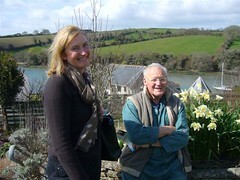 Visiting Kingsbridge in bright sunshine on the first day of Spring was a delight. This is such a vibrant town which has been transformed by community partnership and participation. I spent the day meeting and listening to those at the heart of Kingsbridge; volunteers, councillors, business leaders and residents. Why is Kingsbridge so special? For a start, people live and work here. Its high street has everything and is packed with outstanding independent retailers with true individuality and choice. Like all high streets retailers are burdened with paperwork and complex business rates. But if you haven't visited recently, prepare to be amazed. Thank you to Amanda Bloomer in the Town Information Centre for explaining how Kingsbridge came to be nationally recognised as a destination for walkers. We discussed her favourite walks and I am looking forward to adding one of them to my website runs at the weekend. The Town Information Centre sells 3 excellent short guides for local walkers and has a wealth of information and links for long distance walkers. I met up with Kingsbridge ‘walk and talk' and also went on to the leisure centre to visit several groups who use the centre to get back to fitness after illness with Sandy Gilbert. I met with the inspirational leaders behind Kingsbridge in Bloom and the Community Garden and looked at the plans and problems facing the Memorial Park with Councillors Anne Balkwill and Rufus Gilbert. It was interesting to meet with Irene Jenninga of Healthwise and Peter Sturgess, orthopath to discuss recent European legislation around complementary and alternative medicine and the recent self regulation of the Complementary and Natural Health Care Council, CNHC. Today was also an opportunity to catch up with Inspector Chivers, Jane Corkhill and Paul Cheswell to discuss community policing. 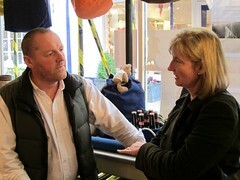 Today I was on a tour of businesses in the Totnes area. I met with a variety of business leaders, including Mike Francis from Foundry Fabrications and Peter Tanner from Tanner Engineering. Foundry Fabrications is a prime example of manufacturing industry continuing to survive and provide wealth creating jobs for 65 people in Totnes. It is vital that businesses like these are encouraged to succeed and remain competitive. Today I was hearing about the pressures of red tape and at times excessive health and safety legislation acting as barriers to taking on staff and apprentices. Later I visited Martin Peacock, from Tiffany Kitchens to hear that the hike in business rates has not just been a problem for Dartmouth and to learn about the issues for businesses that find themselves no longer qualifying for rate relief. China Blue is another business that provides valuable jobs in Totnes, as well as acting as a magnet to attract tourists to the area. Now on two sites and employing 130 people, this is an expanding business with dynamic plans for the future. In the afternoon I had the opportunity to tour the Sharpham Estate and learn about the inspirational work of the Sharpham Trust. If you have not visited, then take a look at their website and follow one of the most beautiful cycle routes in the country to pay a visit from Totnes. Trusts like this achieve so much, they deserve support to expand their work. Today I was in Brixham for an open house meeting. Amongst the many issues raised were winter fuel payments, attendance allowance and inheritance tax. 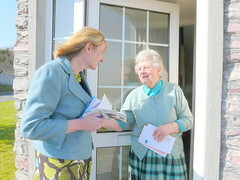 It was also an opportunity to discuss issues for carers and the importance of community hospitals. 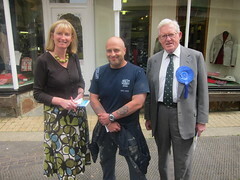 Regeneration of Brixham and concerns about the loss of small businesses were also raised. The proposed Labour National Care Service would have to be paid for in part by cutting disability benefits including attendance allowance. This benefit is currently claimed by 1.6 million people and the potential loss of this is causing great concern. Disability living allowance would also be targeted, which would affect a further 800,000. It is absurd for Labour to be making so many promises on care for the elderly without spelling out clearly who would pay let alone how it could be afforded. 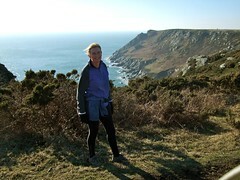 This is a short stretch of 3.5 miles with lovely views over the Dart as well as Torbay. A Google Earth view opens in a separate window. I started after catching up with Gary and Kay Deare in Galleon Post Office and Stores. I have posted Gary's suggestions for improving the profitability of post offices on the chat map; well worth a look. Head down the road past the post office and turn left at Manor Farm, taking the lane towards Galmpton Creek. After a short section along the beach turn inland following the well marked footpath and through a beautiful farmyard. Carry straight on over the road continuing uphill and through the woodland. Turn right as you come out of the trees and follow the path until it divides. Turn left towards Maypool and left again when you hit the track. After about 500 meters, turn right towards Higher Greenway where you keep left. After another 500m turn left onto the John Musgrave Heritage Trail. After about 1km turn left over the railway bridge and head back to Galmpton. If you have more time, this circuit can be extended to include a loop through Churston and Broadsands. The River to Sea route, which is about 6 miles, the views are stunning and Galmpton has two good pubs to call into on your return. 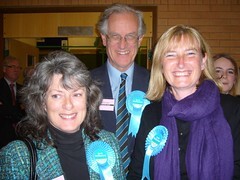 Sarah Wollaston paid her second visit to Dartmouth today. Her previous visit took place on Food Fair day, and she heard a great deal about the rate revaluation problems. She also met with the Townstal Residents' Association to hear from them what they saw as the most important issues in Dartmouth. 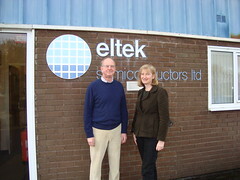 This time, she visited Graham Lewis at Eltek Semiconductors. Graham is an important employer in the town, with a very low staff turnover. He brings a high-tech manufacturing capability to Dartmouth. 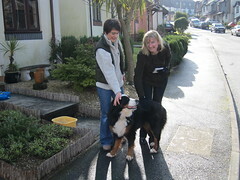 She canvassed in Townstal, and called on Beryl Calder, a former Mayor of Dartmouth. She had lunch with Cllr. Hilary Bastone, and went to The Canvas Factory to speak to Joe Murtagh, Vice Chairman of the Chamber of Trade and member of the Board of Dartmouth Harbour Authority. She visited the police station and several town-centre shops. "I visited Dartmouth early on in my campaign, and learned at first hand about the very real difficulties faced by small business with the proposed increases in rates. I have kept in touch with the group involved, and they know they have my full support. 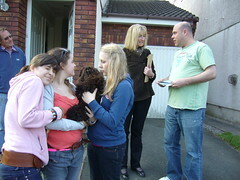 "Today I've been able to meet many more people while I've been canvassing. I've had a great welcome wherever I've been, and am really grateful to all the people who have gone out of their way to keep me informed about the town. There are some difficult decisions to be made if it is to retain its individuality and prosperity, and I'll certainly do all I can to support it." A further tour of Dartmouth hospital, which has just reopened following the so called ‘deep cleaning' exercise currently doing the rounds in South Devon. Dartmouth Hospital has 16 beds, down from 22 beds 5 years ago. It also benefits from occupational therapy and a minor injuries department 7 days per week between 8am and 10pm. It has a daycare unit and Xray open for 2 half days per week. Physiotherapy services visit from Kingsbridge and Totnes and, thanks to pressure from the community and staff at the Medical centre, a much valued paediatric clinic has just been reprieved. Staff would like to be able to increase their ability to admit local patients and prevent the need for unnecessary admissions to hospitals further afield. We desperately need community hospitals to be paid a fair share of the cost of a patient's total hospital stay. In the past, many people would have been transferred to a community hospital bed to recuperate after surgery, thus reducing the risk of acquired infections and allowing visitors to provide support and encouragement. This no longer happens due to the madness of hospital tariff arrangements. Community hospitals are a vital part of the Health Service, but unless we fight to keep local services, they will always be at risk, particularly with a predicted shortfall of over £30 million for NHS Devon in the coming financial year. This was the first hustings of the election campaign with all five mainstream parties represented, and an opportunity to raise points about all of our approaches to transport issues within the constituency and nationally. My message is simple, you can vote blue if you want to go green. One of the reasons that I felt comfortable about joining the Conservative Party was their strong environmental commitment. All the major parties, with the exception of UKIP, have a clear green agenda. My own feeling is that we will achieve far more by persuading 90% of people to make a 10% reduction in their carbon footprint than we will by having 10% cut by 90%. It is important that people do not feel alienated by environmental policy. Nothing is achieved by lecturing people about their cars and far more by making it easier to make greener choices. For the South Hams and Brixham that must include better, integrated and affordable public transport and safe cycle routes. There is huge potential for an expansion in eco tourism in the South Hams; we should make it possible. 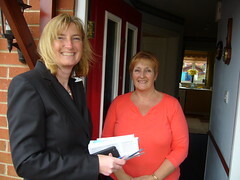 Thanks to Kate Mason, Principal of KEVICC, Patrick, Billie and Steven for taking the time to discuss issues for KEVICC. It was particularly good to have the opportunity to hear from two sixth form students of their experiences and ideas for the future. The best feedback always comes from a school's own pupils. A consistent problem is the disparity in funding between Devon and the rest of the country. I would strongly recommend visiting the fairer funding website to find out more and add your name to the petition to improve funding for Devon's children. 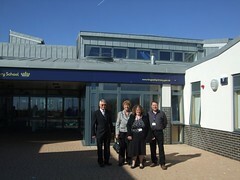 A tour of the school quickly establishes where KEVICC could benefit from greater investment if it had fairer funding. The poor quality of the many ancient temporary classrooms are in stark contrast with the environment within a newer block. Clearly Kate Mason and her team are keen to encourage feedback from the people who matter most, their own pupils. This was an opportunity to visit the inspirational Bidwell Brook School in Dartington, and to hear about issues facing special educational needs teaching from newly appointed head, Martin Dean. There are currently 85 children between the ages of 4 and 19, with diverse special needs, attending the school and each child will have an individually designed curriculum. Costs are always an issue, with the salary bill increasing significantly since the pay re-banding exercise. Highly specialised and experienced teaching staff are important for schools such as Bidwell Brook but again in a small school add disproportionately to the wage bill, as do specialist faclities like the hydrotherapy pool. Bidwell brook benefits from close links to other schools in the Totnes Learning Community and also from strong parental links. Services like speech and language therapy, occupational health, physiotherapy and visiting paediatric consultants are also valued. Issues of concern are ambulance waiting times, which can be up to 30 minutes, and unnecessary red tape within the education system, such as having to annually dis-apply children from SATs and the cost to schools of CRB checks. Bidwell Brook's pupil have recently raised £400 for the Haiti Appeal. Conservative policy is to stop further closures of special needs schools like Bidwell Brook, which are so valued by their pupils and parents. An interactive meeting with a women's group in Brixham to discuss the history of women in politics. Tracing the emergence of the suffragists, like Millicent Fawcett, through the increasing militancy of the suffragettes under Emmeline Pankhust and eventual partial victory in 1918. One hundred years ago, suffragettes like Constance Lytton were being violently force fed on hunger strike in prison in their fight for the right to vote. I wonder what they would have made of the political apathy of today. We desperately need more participation, but that is only likely if politicians can demonstrate that they are prepared to represent their constituents rather than doggedly sticking to the Party whip. After the meeting, issues were raised that are important today; they ranged from international issues like trafficking of women to equality in the workplace and the importance of good careers advice for women. A louder voice in public life was demanded as well as the ability to maintain a work/life balance. I am happy to take part in interactive events, so please contact me if you would like me to attend your meeting. This has to be one of the most beautiful cycle routes in the country. It does help to have someone else on the front of a tandem who is happy to do most of the work, but it is not essential. This is 18 miles that will make your heart sing. A Google Earth view opens in a separate window. Start in Totnes; there are so many wonderful places to eat that I would hesitate to make a recommendation. This time I had the haloumi and red pepper panini at the Royal Seven Stars. Excellent. Turn right at the bottom of the High Street and set off for the Plains. Look out for the start of the trail on your right, just before Baltic Wharf, and follow this up the hill before continuing on a magical stretch above the river Dart. You will have to dismount for a short section through the woods but then continue on the path until the entrance to Sharpham Drive. At this point the national cycle network, NCN 2, is well signposted and you can follow the country lanes through Ashprington and Tuckenhay. For an extra hill, drop down into Cornworthy and back up again, or if you prefer, just stick to the high ground straight on and then freewheel down into East Cornworthy. Slog up the hill following the signs to Dittisham and then enjoy another great coast down to the Ferryboat Inn. We rang the bell, but had missed the last ferry. Thank you so much to Brian, the most generous man in Dittisham, who rescued two complete strangers on a tandem and ferried us in his small boat across to Greenway. Thanks also to Barry, more used to sailing around the world than crossing a few yards of water, who helped to get us on our way. We owe you a ride. From Greenway Quay, head for Galmpton and then keep left for Waddeton. I would recommend heading down to Stoke Gabriel to rest by the lovely Mill Pool, but by the time we reached Pords Bridge it was dusk and getting cold so we missed this loop and kept on to Aish. If you have ever tried changing a tyre by the non existent light of a dynamo, you will appreciate why we headed straight on to Loncombe Cross and the main road back to Totnes. With better planning and an earlier start, the tiny lane on the left just past Aish is a much better option and avoids the A385. OS Map OL20. If you feel that there is nothing to match a woodland run beside a beautiful river, then you cannot fail to enjoy this lovely 5 mile stretch along the Avon Valley near Loddiswell. Park at OS Map ref 728483, the Avon Mill Garden Centre, and then decide whether or not you feel in the mood for a very steep hill. If so, turn right out of the car park and slog up one of Devon's steepest as far as the track on the right towards Cloverwell Farm. Just off the road take the green lane on your left towards Ham Butts. At the junction, turn right towards Reads farm. It is easy to miss the entrance to the footpath on your right, but if you find yourself in the farmyard, turn around and you will see it below you. Stick to the path and you will soon be running along the river before joining the dismantled railway line. No need for your map at this point, just keep going until you reach the lovely Topsham Bridge, which is sheer Devon heaven. Sit on the bridge and look out for the peacocks. Run back the way you came but stick to the eastern side of the riverbank all the way to the old Loddiswell station. Continue a short distance on the country lane before turning right and crossing the bridge back to Avon Mill Garden Centre for buttered crumpets or sausages and mash with onion gravy. You might also want to check out the deli for later. Superintendent Sarah Sharpe holds responsibility for policing in the South Hams and West Devon, a huge area reaching from Okehampton and Tavistock in the North as far as Salcombe and Dartmouth in the South. Not only geographically widespread, but also with widely different policing needs. We covered a range of issues from the ways in which the police are trying to improve public confidence in their service to the strategy for tackling key local concerns like antisocial behaviour and alcohol related crime and disorder. The police do have concerns about underage drinking but are having success with joint operations with trading standards to catch up with problem premises. The police will always try to ‘unpick' an alcohol trail where they have had to take home an underage drinker or deal with alcohol related violence. Depressingly, the police still find that in most cases it is parents who have supplied the alcohol with which young people are able to ‘front load' before a night out. Thankfully, this part of Devon remains a low crime area and the risk of being a victim of crime is very small. We talked about road safety in and around Totnes. To date there have been no fatal accidents or serious injuries on Totnes High Street. The main issues are around trying to improve safety for motorbikes and young drivers through programmes such as ‘learn to live'. The police are also working to involve the community in speed reduction measures; school speed watch has been especially powerful in the way that school children themselves ask speeding drivers to consider the consequences of their actions. We talked about the role of police community support officers, PCSOs, who Supt. Sharpe feels are vital to community policing. What do you think? Although Ashburton will not be part of the Totnes Constituency at the next election, many pupils from this area and the Moor attend South Dartmoor Community College. It was a privilege to catch up with Ray Tarleton, headmaster, to discuss issues facing secondary education in South Devon. Funding is always an issue, and Devon is 4th lowest in the national league table for funding. To put this in context, if South Dartmoor pupils were funded at the same level as children in Bristol, the school would receive an extra £1 million in funding per year. Whilst no one would dispute that inner cities need extra funding, there should also be recognition of rural deprivation and the huge drain on budgets caused by school transport in Devon. CRB checks, currently costing £67 per head for all 250 staff employed by the College are another new drain on resources. Schools accept the need for checks, but it seems that they can at times be unduly cumbersome, and they increasingly interfere with even simple routines like showing prospective parents around school grounds. The College benefits from Trust School Status as well as Specialist Status and has valuable partnerships with local businesses as well as Exeter University. Above all it is clear that this is a college with strong leadership and an ethos of transparency, praise and support. The message from the teaching profession is the same as that from medicine; trust professionals to be professional and to make the right decisions, and give them freedom within their budgets to act in the best interests of their pupils. Meeting at Thurlestone with members of the Chamber of Commerce to discuss problems facing businesses in South Devon and Conservative proposals to help. Thank you to everyone who shared their experiences and for some of the detailed letters that I have received following on from the meeting. There were many issues raised including the VAT threshold, the pressing need to make it easier to take on more employees and above all the problems that businesses are having with banks. It cannot be acceptable for businesses to have unilateral and often arbitrary sounding penalties imposed such as the abrupt halving of overdrafts, the imposition of ‘monitoring fees' and standing order charges or the delayed clearance of payments. It is a depressing reality for businesses that Government insured enterprise finance loans have not always been advanced in a way that many businesses would have found helpful. All of these situations have resulted in businesses not taking on staff who would otherwise having been creating local employment. Today I met with representatives from the NHS Confederation to discuss their thoughts about Conservative Health Policy and how this important organisation, which represents all sectors of the NHS, sees the issues around real budgets being devolved to GPs. Clearly it is important for anyone interested in the problems facing the NHS to be aware of issues from all points of view within the organisation. Conservatives want commissioning of services by local doctors, who have the needs of their own communities at heart, not services dictated by central government. We also discussed the issues around public health policy and in particular the urgent issue of alcohol. My long held views and concerns on alcohol policy are detailed under the Campaigns Tab of this website. An opportunity to discuss Conservative Health Policy and the implications of this for South Devon. I felt reassured that the focus for healthcare under a Conservative government will be on outcomes (the results of treatment), rather than targets. Whilst some targets have been helpful, so many of them have had a distorting impact on patient care. Take waiting time targets in A&E, for example. Whilst on paper who could deny that no one should wait longer than 4 hours in casualty, the reality is of patients kept waiting in ambulances outside so as not to start the clock ticking, or others discharged to inappropriate wards. Paying trusts by results, so that there is no reward for someone seriously harmed by a hospital acquired infection, will do more to improve standards than managers focusing on meaningless targets. I am sure patients will welcome the commitment to greater openness within the NHS. The promise that everyone will be able to access surgeons' results and up to date figures for the rates of hospital infections. Whilst in rural areas, my experience is that most people prefer local and accessible care, it is good to know that patients will continue to be able to chose to travel elsewhere should local standards of care in some areas be shown to be less than at competing hospitals. Daylight is the best disinfectant; openness about results and infection rates is essential to drive up standards. The current NHS choices website is dismal and needs to contain the information that patients actually want to see. As for community hospitals, my personal crusade is to ensure their survival. GPs will hold the purse strings in the NHS under a Conservative government and so, where these hospitals are important to local people, GPs will be able to ensure that they receive a fair share of funding from their budgets. On a freezing day in early January, when most of the South Hams was too slippery with snow and ice, the coast path was perfect for a cold run by the sea. OS map OL20, park at 823419, in the centre of Torcross. A Google Earth view opens in a separate window. Head uphill on the steep minor road towards Widewell but after a short distance take the first left following the coast path towards Beesands to enjoy spectacular views across both Slapton Ley and then Widdicombe Ley. At this point just follow the coast path all the way to Start Point and the lighthouse, passing Tinsey Head and Hallsands and stopping to look back at the ruins of the original Hallsands village. If, like me, you thought the run seemed easy on the way there, turn around at the lighthouse to feel the the full blast of an icy north wind and you will have earned your outstanding cream tea at the Sea Breeze cafe by the time you return to Torcross. Spectacular. If you want to fudge an unpopular issue in Government, one of the easiest ways is to use bad science as an excuse to avoid important decisions like culling diseased badgers. The Randomised Badger Culling Trial, RCBT, has been held up as a reason not to take action on bovine TB. I met with recently retired DEFRA vet, Linda Farrant, to discuss concerns about the RBCT and the attitude of vets to this important issue. This trial was fatally flawed from the outset, as it did not allow the investigation of whole set culling, but only allowed for very short 2 week periods of cage trapping and shooting of badgers. The trial areas were far too small and the trial of so-called reactive culling, was only continued for 1 year. The trial was logistically flawed and severely disrupted by foot and mouth disease and, in some areas, by animal rights activists. The report of the scientific group was that culling could not be justified due to an increase in bovine TB at the boundaries of culled areas, but ongoing analysis of these boundary areas showed that in the years after the cull, there was a drop in bovine TB; these results were published, but too late for them to be taken into account. Vets are agreed that badgers are an important vector for transmitting TB to cattle. The cattle are repeatedly culled but the source of infection is allowed to remain. This makes no sense and is immensely damaging to the morale of farmers battling to keep the disease under control. The problem is spreading; Linda told me that cats are now becoming infected as well as other animals like alpacas and deer. Whilst there is no risk from drinking pasteurised milk, there is a risk to farmers and all of them will know of colleagues who have been affected. For badgers too, TB is horrific, resulting in a slow and distressing death. Badgers can suffer for many years with the disease and are heavy excreters of bovine tuberculosis bacteria in their urine, faeces and saliva; far more so than cattle. Many people assume that vaccination trials hold the key to solving TB in badgers, but this is not the case. Vaccination will never treat a diseased badger, and it will be years before we know if it can be effective in preventing it in healthy badgers. I fully support the farming community in their call to allow culling of diseased badgers to help prevent the inexorable spread of TB especially in Devon, which has the highest incidence in Britain. In the first 6 months of 2009 provisional figures are 4600, so we are on course for another huge annual increase. Doing nothing should not be an option. I am grateful to the Rossiters and the Hockings for taking the trouble to explain more about the difficulties facing farmers in the South Hams. 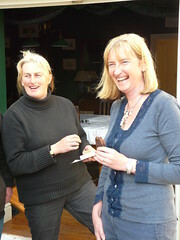 For Anne and David Rossiter, who used to have a herd of 350 with 120 milkers, the trouble with bovine TB started in 2003. After 4 years struggling to contain the disease, complying with all the recommended measures, a further 89 were positive on blood tests in 2007 and they could not carry on. No one should doubt the devastating impact of bovine TB on farming families and the knock on effects this will have on our food security. The Rossiters, like so many others in the South Hams, have stopped dairy farming altogether and are now arable and sheep farming. As a direct result, two full time employees lost their jobs. Have you ever wondered what happened to milk quotas? They are no longer an issue as the UK does not produce enough milk to meet our quota. Farmers like the Rossiters have had to diversify into tourism and also rely on the single farm payment to help make ends meet. Graham Hocking is the 3rd generation of his family to farm at Burton Farm. He too has had to give up dairy farming in 2004 as a direct result of bovine TB. 300 more dairy cows missing from the hillsides of the South Hams. Having lost his dairy herd, it was simply too capital and labour intensive to restock a dairy herd so he switched to an organically reared South Devon herd. This was a closed herd from a TB free area, again reared with strict adherence to measures designed to reduce the risk of TB. Sadly, in November 09, they had 15 reactors and 8 inconclusives and have therefore not only lost 15 of their herd but remain under restrictions. The testing regime is labour intensive and not financially compensated, it is also very distressing for the cattle. There is no doubt that badgers are an important reservoir for TB in cattle, and it is madness to allow the number of diseased badgers to increase unchecked whilst continuing to ruthlessly cull cattle. We know from the experience of farmers like the Hockings, that even herds that have had no exposure to other cattle and are reared organically, will go down with TB if grazing on land infected by badgers (which are super excreters of TB in their sputum, urine and faeces). It is time for the government to take action. It was a privilege to meet with Alan Worthington, Jean Daley and Elli Pang, from the Devon Health and Social Care Forum, to discuss their concerns about the interface between Health and Social Care in Devon and politics. There are real concerns at the way patient and carers' groups have come under the umbrella of Local Involvement Networks, LINks, an organisation set up by the government to support patients and carers' input into the way services are run. In practice, voluntary groups are concerned that department of health civil servants, funded from the LINKs budget, are trying to put LINKs ‘on message' with the result that they are sometimes unchallenging or pushing community groups to accept services that they do not want. We discussed many issues including the importance of community hospitals and how DHSC forum would like to see more funding for specialist community nurses. We discussed in particular the role of Admiral Nurses in supporting patients with dementia. We agreed that the needs of carers and those suffering from mental health problems are sadly neglected in the NHS and social care, and we hope to maintain a dialogue to discuss concerns in the future. This is something a little more challenging, to run off the mince pies. 13.6K with several steep climbs rewarded by some of the best views in the South Hams. OS Map OL 20. A Google Earth Map opens in a separate window. There are two guaranteed rests on ferries across the Dart and a visit to one of Devon's most famous pubs, the Ferry Boat Inn. Start at the higher car park, OS grid ref 864548 and head up the hill before turning sharp left. Look out for the marker posts for the start of the Dart Valley Trail on your right. This section of the trail is well marked and takes you up a steep hill to a country lane where you continue left up to the top of Fire Beacon Hill. Keep to the lane through Bosomzeale then I follow the Dart Valley Trail marker posts on the right. After a short flat section, the trail then drops down to Old Mill Creek before the inevitable steep hike back uphill to Townstal. Cross the A379 and either continue on the Dart Valley trail or take a loop through the lovely Saxon churchyard before rejoining trail which will eventually take you down the beautiful Brown's Hill Steps and into Foss Street. Head for the river and then turn left towards the higher ferry. After a short rest with fabulous views of Dartmouth and Kingswear, head left after crossing the railway line and then turn sharply right uphill just past the public conveniences. After a steep climb enjoy a beautiful gently undulating woodland run above the Dart. It doesn't last; there are more climbs and drops but stick to the trail and at higher Greenway follow the path to Greenway and then the final coast downhill to the ferry. Ring the bell and catch the ferry across to the Ferryboat Inn for the best seafood linguine you'll ever taste. Dogs very welcome, even if they do, apparently, taste like chicken. This is a fabulous 9.5K run around the most southerly point in Devon, with one of its best pubs to collapse in at the end of the route. OS Explorer Map OL 20. A Google Earth Map opens in a separate window. Park next to the green at East Prawle (OS 781364) and head past the Pig's Nose pub before turning north then east in the direction of Woodcombe Farm. Turn right before you reach the farm, following the footpath, which then bears sharp left. At the junction turn right towards the coast and head down towards the sea before keeping right to follow the coast path rather than dropping down to Woodcombe Sand. Stick to the stunning coast path heading southwest along the cliff top. This is an area of outstanding natural beauty, mostly easy underfoot but with occasional steep rocky sections giving an opportunity to catch your breath, admire the view and wonder how ‘Stinking Cove' earned its name. At Prawle Point, turn left off the path and head out past the Lookout Station to stand at Devon's Southern tip and try not to get blown away. Head back and then left towards Gammon Head. Just past Ellender Cove turn right and run up the steep hill before following the footpath north. Turn right at 767362 along one of the South Ham's beautiful green lanes. When it joins the small steep lane, turn left and head up the hill back to East Prawle to enjoy roast chestnuts in front of the fire at the Pig's Nose. I can also recommend the scampi and chips. 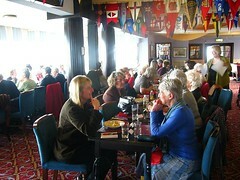 If you like that kind of thing, you could add a few rows to the pub's knitting or even catch a game of scrabble. Lovely. I am a pretty useless runner, but I try to get out several times a week. Since this really is the most beautiful constituency in Britain, during the campaign I will be posting a series of short runs and cycles that showcase its variety. You can view maps of these runs which open in a separate new window. If you have any favourites to recommend, I would love to hear from you. I married a fitness junkie who has invested in a device to measure exactly where you have run, so there is sadly no opportunity to exaggerate the distance. 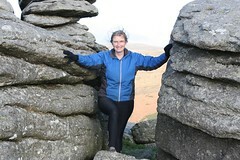 This run starts at the most northerly tor in the constituency, the stunningly beautiful Combestone Tor. Follow the road northwest from Venford reservoir and park in the carpark across from the tor (grid ref 670 718) Head south towards Holne Moor until you reach the old tin workings. Once past these, head east on Sandy Way. Head back towards the lovely Venford reservoir at the next tin workings, and try not to loose your trainers in the bog as I did on several occasions. At the road, head northwest across Venford dam and then back towards Combestone Tor, following the off road track where possible. 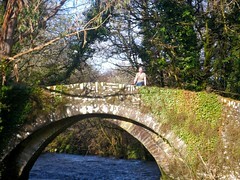 8km of glorious views and Dartmoor history. Then I recommend heading back to Holne for hot mince pies with clotted cream and mulled wine at the village stores and tearoom and/or recovering from it all in the Church House Inn. It will be worth it. 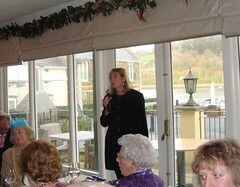 The Conservative Women's Organisation Christmas lunch was a lively affair and a chance to raise women's issues. Since women were given the vote and eligible to stand for Parliament in 1918, there have only ever been 66 Conservative Women MPs. If elected, I will take the opportunity to speak out on women's issues. I have an interest in reducing domestic violence and also international efforts to improve rights based family planning. Wherever women have access to education and contraception, they usually chose to limit their family size and thereby reduce poverty. I would also like to see a more robust approach to championing women's rights, not just in certain authoritarian states, but also in the UK, where it is now depressingly commonplace to see women faceless beneath burqas. One woman's freedom to choose so easily leads to peer pressure on others to wear the veil, and that can only act as a barrier to communication with others. We have only to look at what has happened to women's rights in the Swat Valley to see the ultimate goal of the extremists. To women who insist that the burqa is liberating, I would say that your freedom is another's enslavement. Individual freedom should always come with the responsibility that it does no harm to others, and I see this isolationism behind the full face veil as directly damaging to community cohesion. This was a public meeting and a chance to discuss politics with group from all political backgrounds. These events are always challenging and an opportunity to debate issues from bovine TB, farming, education and the health service to international politics and the economy. Thank you to everyone who attended. I am committed to representing this constituency and if elected and will always be open to argument. 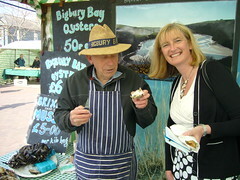 Small businesses are vital to the economy of the South Hams. This was an opportunity to hear about the issues facing businesses, particularly looking at the barriers that prevent them taking on more staff. Improving transport links, reducing red tape and the burden of extra costs such as holiday pay for temporary staff and national insurance payments were all major factors that would improve the chances of independent retailers surviving the recession. We also discussed the issue of high business rates, which will hugely increase costs in Salcombe as well as Dartmouth, both towns being hit by high rental values which form the basis for the 5 yearly rate reviews. If you have a small business issue that you would like to raise, please let me know. This is a small primary school with less than 70 children. It has to have one of the best playground views in the country, but more importantly it has dedicated and caring teaching staff led by Sue Warne, head of teaching and learning. Salcombe Primary is one of the first schools in the country to have federated status. This means that it has joined forces with three other Devon primary schools to share expertise in the management of the school. Whilst so many high streets have become indistinguishable clones, Totnes is unique. Its rich mix of independents and physical beauty are the draw for shoppers from near and far. I started the day feeling that all that was needed was pedestrianisation to improve the experience of strolling up and down the high street. If only it were that straightforward; after talking with retailers and the Chair of the Chamber of Commerce I am concerned that pedestrianisation could kill off the very businesses that are the heart of Totnes. In fact a fully pedestrianised high street is impossible; many of the businesses have no other access at all for deliveries. If they all had to have deliveries before 9am, what impact would that have on residents and how would the the street cope with all the delivery traffic at the same time? One retailer volunteered to phone anyone who would like him to be available for a 6am delivery every day at the same time to point out how inconvenient it would be to run a small family business with even more antisocial hours. Would there be an exemption for blue badge holders? What about residents and emergency services? What about Bob the bus and taxis? There is also the fact that there has never, thankfully, been a fatal accident on the high street, but in areas where partial pedestrianisation has been introduced, it seems that this proves even more dangerous as pedestrians are not expecting traffic and tend to take less care. Roy and Bernard Apps pointed out that Royberns saw a 35-40% drop in business during last year's roadworks when the road was closed. With businesses already facing rate rises of over 15%, they cannot afford to see a drop in custom. 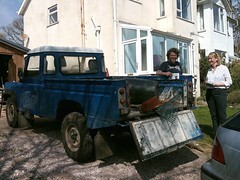 Some businesses, like Totnes Pet and Garden, rely on cars being able to load heavy goods at the front door. Who would choose to walk with heavy sacks of pet food to the nearest car park; is there is a risk that they might chose to shop elsewhere? By the end of the day, I was left feeling that more severe speed restrictions and a change of philosophy might be better. Why should vehicles have the right of way over pedestrians? If there were a walking speed restriction on the high street, this would deter those who inappropriately use the high street as a rat run. Less that 5 miles per hour would be sufficiently infuriating to through traffic without deterring those who are coming to support local businesses. What do you think? A visit to hear about the importance of the Hope Cove Rescue Boat from Ian and Paul Pedrick. Brothers Ian and Paul have had 62 years of experience between them in manning the Hope Cove Rescue boat and are the 3rd of 4 generations of volunteers from Hope Cove, Max Pedrick, 18, having just joined the crew. 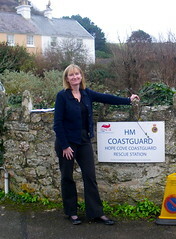 There has been a rescue boat at Hope cove for 150 years and for good reason. The boat can reach Burgh Island in 12 minutes from the time that the call goes out on a volunteer’s pager. Compared with the 30 minutes from pager that it would take the Salcombe lifeboat to be on scene, it is no wonder that the local community is so keen to protect this lifeline. The service is currently restricted by the Marine and Coastguard Agency to operating between Bolt Tail and Butter Cove but would like to serve an area between Soar Mill Cove and the River Erme. At a cost to the MCA of around £1300 per year, this has to represent good value for money. Meeting with Simon Tapley to discuss ideas for the future of commissioning and healthcare priorities in South Devon. Public Meeting Kingsbridge - Cheap Booze, who pays? A lively interactive meeting to discuss the issues around cheap alcohol and the impact on levels of crime and disorder that have followed. The evidence is clear from international research that pricing and availability are the factors that have the greatest impact on binge drinking. We must allow the police and councils greater control to shut down problem premises. Minimum price alcohol of 50p per unit is the only way to prevent big supermarkets from flogging off cheap alcohol as loss leaders. We know that these promotions are used by problem drinkers to ‘preload’ so that they are already drunk before they leave home and that children appear to have no difficulty in obtaining cheap alcohol. I am not in favour of remorselessly increasing taxation, which works against licenced premises, but would like to see them able to compete on a level playing field; only minimum price alcohol can achieve this aim. Attended the meeting with the Valuation Office to discuss the exorbitant business rates rises in Dartmouth. Congratulations to Tessa de Galleani and the business community for their efforts in galvanising support for an appeal against the outrageous increase in Dartmouth’s business rates. Please read the comments below by Joe Murtagh (pictured with me at the Canvas Factory later), who is the vice chairman of the Dartmouth Chamber of Trade. A lively and interactive discussion on the ethical issues around assisted suicide for the terminally ill. My thanks to all who took part. Since the DPP’s guidelines we do, to all intents and purposes, have a situation where assisted suicide is allowable in this country. The majority view at the meeting was overwhelmingly that we should keep with the status quo and not prosecute those who are pushed, in extreme circumstances, to come to the aid of a loved one requesting assistance with suicide. Included a meeting with Shadow Secretary of State for Health, Andrew Lansley. I hope that if elected as your MP, as one of the few candidates with a healthcare background, I would be able to promote the interests of patient care and in particular to fight for care that is accessible and local. I have a particular interest in Community Hospitals. I would like to thank Bob for fighting the Bridgetown seat at the district council elections and hope that he will continue his involvement in politics. 13.5 million people work for small businesses, that is 58% of the private sector workforce. Small businesses are vital to the economy of the South Hams and Brixham and the Conservatives are committed to improving their chances of surviving the recession. SMEs spend 7 hours per week on paperwork and new regulations introduced in the last decade have cost businesses £76.8 billion; much of this regulation involving the European Working Time Directive. Conservatives recognise that small business is the key to the recovery and will establish a National Loans Guarantee Scheme to getting business moving. The Conservative Party is committed to reducing the burden of regulation and simplifying employment legislation to make it easier for businesses to take on new employees. To visit South Devon College is to wish that you could go there yourself. It has a wow factor that extends far beyond the entrance hall and the stunning atrium. There is an atmosphere of warmth and engagement in every room; small wonder that Ofsted awarded it ‘outstanding’ in every category. I spent an afternoon with the Principal, Stephen Criddle, to hear what politicians should be delivering to help exceptional places like South Devon College. As with all schools, the main issues are around unnecessarily bureaucratic funding arrangements and the difficulty schools and colleges face in trying to make long term plans. The situation is only set to get more complicated once the Learning Skills Council is replaced by the Young Peoples’ Learning Agency, the Skills Funding Agency and the National Apprenticeship Agency. A single funding body would be much simpler to deal with and greater fairness is needed in the allocation of funding for students from Devon, which is below that for many other areas of the UK. Capital funding has been another difficult issue; two years down the line and £1.5 million spent developing Phase 2 to expand facilities at South Devon College, only to find that the grants have been axed and the college left to pick up the bill. Not one of the promised capital grants came to colleges in the South West. Other items on the wish list for South Devon College would be improved learner choice, with better access to impartial advice for year 11 pupils before they make decisions about their future education. There is real concern at the numbers of pupils who become disillusioned with conventional A-level courses and drop out of education altogether. South Devon seeks to re engage young people not in education or employment using a range of strategies. The college has been looking at the barriers to taking up education and sees tackling transport as a crucial issue. Whilst some students may be eligible for free travel, this is often restricted to a single supplier, which may not allow students to travel at the most convenient time. The cost of bus travel is a great barrier to learning for many and perhaps it is time to look at sharing subsidies more fairly between pensioners and students. Safe cycling routes around the Bay might also encourage many to use a bike to commute to college. So the take home messages for me were to try to push for simplified and fairer funding, improved access to transport and transport links and increased learner choice. Capital grants that deliver what they promise and a VAT exemption would be the icing on the cake. To visit a community hospital like Brixham is to feel immediately that this is where patients come first. I have personally know many patients who would rather die than be admitted to any large general hospital. They fear that their friends and family would be unable to visit and dread the prospect of hospital infections or feeling lost amongst strangers. Community hospitals are as close as possible to home from home and we must fight for their survival. It should not be forgotten that they also provide a range of clinics close to home such as paediatrics, gynaecology, care of the elderly and mental health as well as physiotherapy, ocupational therapy , minor injuries and xray facilities. Only too valuable when the alternative is a battle with the Bay’s traffic to reach Torbay hospital. Housed in the old police station at the top of Fore Street, Brixham heritage museum is a wonderful resource for the local history. Congratulations to the dedicated team of volunteers that keep Brixham’s rich history alive. Met Dave Casley and his team at the enquiry office to hear about the efforts that have been made to engage with young people in Brixham and to work with the community to ensure that Brixham continues to enjoy low crime rates. Although I didn’t realise how valuable the ‘Sergeant Brixham Team’ Cop Card was until I reached Furzeham Primary School. With over 140 volunteers, Brixham Does Care is an outstanding example of how a voluntary group can do so much to serve the community. Take a look at their website to see their range of services and opportunities for people of all ages and backgrounds who are coping with difficulties in their lives and the kind of outreach work they do, not just in the Town Hall but extending to the lonely and housebound. I toured the proposed town centre and car park development to see, with councillor Chris Lewis, the importance of the Brixham Town Centre Redevelopment. We must keep business in the town rather than allow this to haemorrhage to out of town superstores. Meeting staff and residents to listen to their concerns about issues from healthcare to transport and law and order. Meeting staff and pupils from the school council, to hear about the children’s concerns about traffic around the school and the need for more science and IT equipment. Please sign up to the F40 petition on the number 10 website to help to campaign for fairer funding for Devon’s school children and ensure that every child matters. Brixham is a foundation school and specialist arts college. It has had its best ever year of GSCE results and is clearly a thriving school with close links to the community through its adult learning centre. Talking to staff, it is clear that Devon’s children are hugely disadvantaged by the current funding formula. Schools are also concerned about the effect of diplomas, which have led to massive funding for tiny numbers of pupils attending diploma courses whilst leaving funding for conventional courses relatively starved of cash. This is a school with outstanding results. One of only 164 remaining grammar schools in the country. It has foundation status and is a specialist humanties college. I fully support grammar schools like Churston remaining as part of the mix of schools within the South Hams and Torbay. The needs of the fishing industry will be high on my agenda if elected as your MP. Fishing is vital to the economy of Brixham, the most important fishing port in the country. We need to be clear that this industry is in grave danger and that with the ratification of the Lisbon Treaty and the enlargement of the EU, our precious resource is being spread ever thinner and our control over decision making even less. We must also resist environmental dogma from quangos such as Natural England that seek to impose restrictions on inshore fishing whilst ignoring successful voluntary schemes operated by local fishermen. Congratulations to the Brixham Trawlermen who have shown through ‘project minus 50%’ that voluntary local trials can have a huge impact in reducing the horrific discarding of dead but healthy fish into the sea. 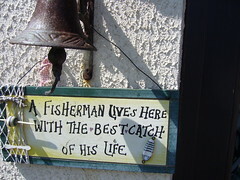 It is local fishermen who have the greatest interest in sustainable fishing to preserve their industry for the future. Meeting with Mayor Nick Bye and his deputy Chris Lewis. Meeting with Rob Hopkins, founder of the Transition Movement and author of the Transition Handbook. Peak oil and global warming are the biggest challenges ahead for the 21st century. Rob’s visionary ideas and the aims of the Transition Movement have rightly established Totnes’ national and international reputation as a champion for change in environmental policy. I am committed to working with Transition Town Totnes if elected as your MP and support their views on almost all issues except for nuclear energy. I do feel that nuclear power needs to stay as part of the mix if we are going to achieve reductions in CO2 emissions and prevent the lights going out over Britain. No government should have allowed such a yawning gap in energy security as we will now face in the next decades. 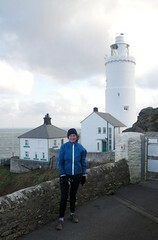 This was a bracing 10.4K run along the stunning coast path route from Broadsands to Brixham. Park in the car park at Broadsands and follow the clearly marked coast path route to Elberry Cove then head via Churston Cove up to the Brixham Battery heritage Centre and then down the steep path to Fishcombe Cove. Head up through the archway at the far end of the beach and follow the path towards Brixham passing the beautiful new fish market and then carry on around the harbour. On the return route, if you don't like retracing your steps, head through the woods following the signs to Churston instead of heading down to Churston Cove. This path along a short stretch of the John Musgrove Heritage Trail, takes you past the lovely Churston Court, perfect for a glass of mulled wine to warm you up before continuing through the golf course and back down to Broadsands. 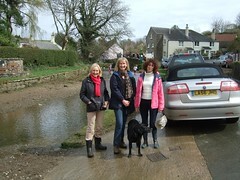 Visit to Churston traditional farm shop. To hear more about the crisis in farming and the way that farmers have had to diversify to cope with economic conditions. We must do more to support local sustainability and reduce the insanity of the ‘food miles’ travelled by produce on its way to big supermarket shelves. In Transition presentation at Dartington. 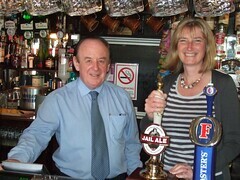 Visit to Brixham Conservative Club. See the work of the Lupton Trust. Official re-opening of Dart Ward. The section of the A379 linking Torcross and Strete, is vital to the local economy and environment. At some point in the future the line may be eroded by the sea, but in the meantime we must fight to keep the existing road open whenever it can reasonably be repaired. I support the work of the Slapton Line Partnership in preparing for alternatives should there be a devastating breach at some point in the future, but this should be a contingency plan and not seen as the first option in the event of repairable damage. Community hospitals are my passion and in communities like Kingsbridge they are a real lifeline for those who do not want to be in large general hospitals. The NHS will face tough decisions about spending over the next decade and I am committed to fighting for community hospitals to ensure their survival. It was the threatened closure of my own local community hospital that first brought me into politics and I will take every opportunity to raise their profile if elected as your MP. 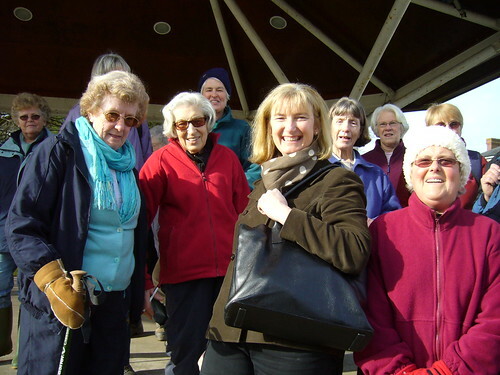 Every Wednesday, this scheme provides an opportunity for socialising and fitness as a team of volunteers leads three levels of walkers out and about from the centre of Kingsbridge. This was an opportunity to meet a group of walkers and volunteers. I know, from my own work as a GP, how important ‘walk and talk’ can be for anyone who would like to get back to fitness and or just to make new friends. No fitness is required to get started, so just follow this link.